Established in 2010, Urban Grind Coffee Company has been the downtown destination for great-tasting, locally roasted premium coffee. 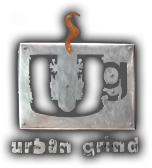 Urban Grind artisan roasts & flavors our coffees in small batches taking note of each delicate flavor characteristic of the beans and fine-tunes along the way. We are committed to offering high quality coffees & food. You will be sure to taste the difference. The company has two locations both in the Urban Core of Jacksonville, Florida. The original Express location is located in the lobby of the Bank of America Building (the tallest building in Jacksonville). Have meetings scheduled all day,? No time to leave the office? Come see us at this Express location for a quick latte or bite to eat. Café seating available. Have a little more time or need to take a break from your hectic day? Then stop by our storefront location in the historic Drew Building. We took “Reduce, Reuse, Recycle” to a whole new level restoring the over century old space into a vibrant, and cozy café; upcycling fixtures, furniture and other design elements. Urban Grind focused on creating an eco-friendly space with repurposed construction salvage. This hidden gem features the most unique, multipurpose atrium in the heart of Downtown. This location represents the first truly, independent coffeehouse in Downtown Jacksonville. Our exclusive design is based on dozens of coffeehouses visited around the world. It is our pleasure to bring this authentic coffeehouse experience to the Jacksonville Urban Core. There’s nothin’ but good vibes here. Our coffeehouse menu features some of your favorite bistro foods as well as a rotating cast of specials that are sure to make ordering just one lunch item a challenge. All of our meals are made with love and care selecting premium ingredients and it comes through in the flavor. It will be hard for you to stay away from our selection of delicious bistro food after you have tasted it for the very first time. Whether you are enjoying one of our fresh gourmet sandwiches, soups or fresh salads for lunch or meeting friends for our locally roasted coffee and specialty drinks, you are sure to leave feeling happy. Want to share your favorite menu choices with your co-workers, friends, or family? Catering services are also available. Contact us for wonderful food and drinks that are sure to hit the spot. Our friendly baristas love providing excellent breakfast, brunch, lunch, and coffee favorites to the entire downtown area of Jacksonville, Florida. © Copyright 2019 Urban Grind Coffee Company. All Rights Reserved.